Another beautiful atlas map for Hârn. 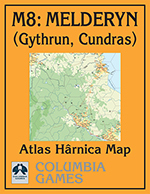 This covers parts of Melderyn from the Anadel Highlands to the Gulf of Denina. This atlas map covers points of interest such as the above mentioned Cundras Castle and outlying areas. But that is just one location! There is also Gythrun and Fosumo on the map as well!